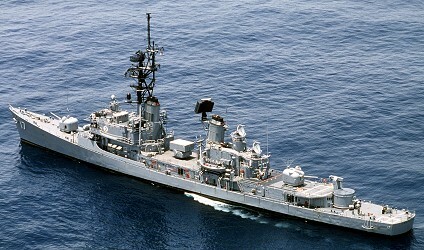 USS CONYNGHAM was the 16th CHARLES F. ADAMS - class guided missile destroyer and the third ship in the Navy to bear the name. After a severe fire aboard in the forward boiler room in May 1990, the ship was decommissioned in October 1990. 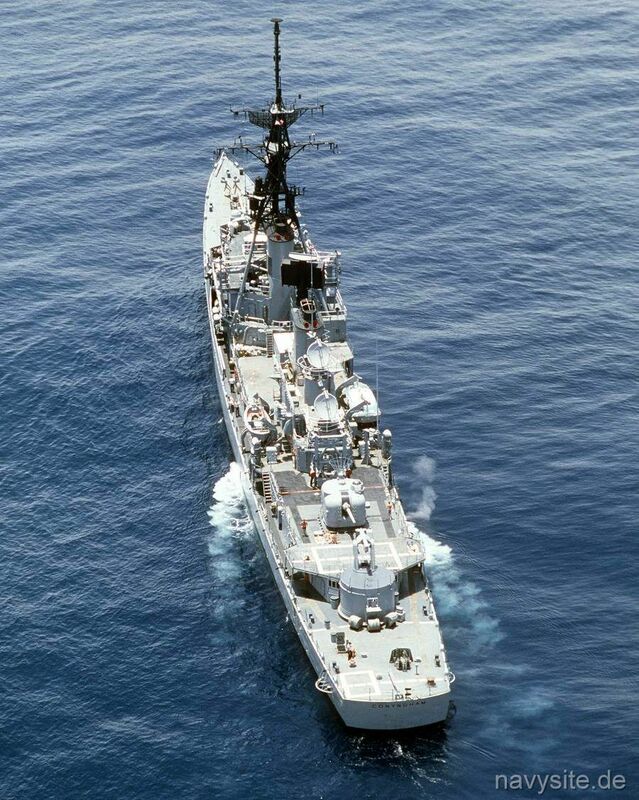 She was stricken from the Navy list on May 30, 1991, and was sold for scrapping on April 15, 1994. 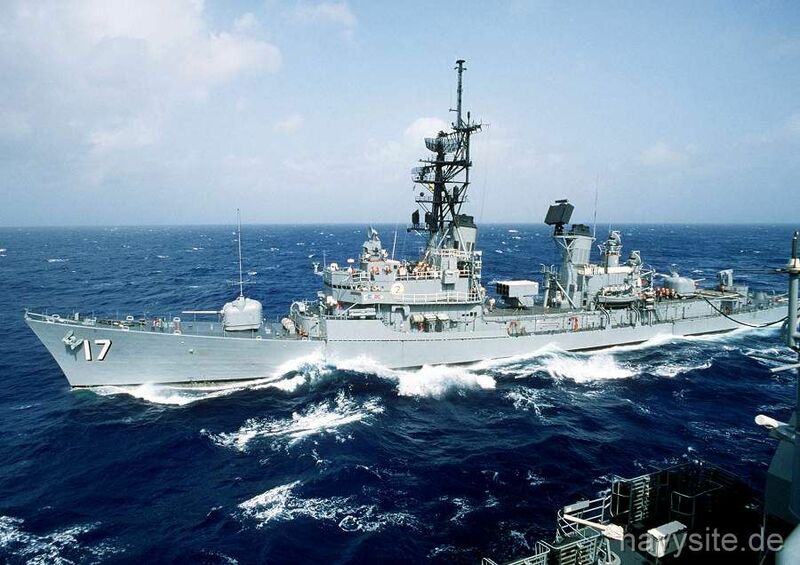 USS CONYNGHAM was broken up for scrap by J+L Metals in Wilmington, N.C. in 1995. The ship was last homeported in Norfolk, Va. Builder: New York Shipbuilding Corp., Camden, N.J. This section contains the names of sailors who served aboard USS CONYNGHAM. It is no official listing but contains the names of sailors who submitted their information. 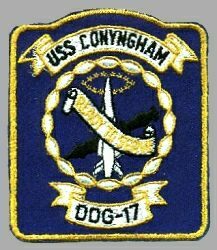 Click here to see which USS CONYNGHAM memorabilia are currently for sale on ebay. 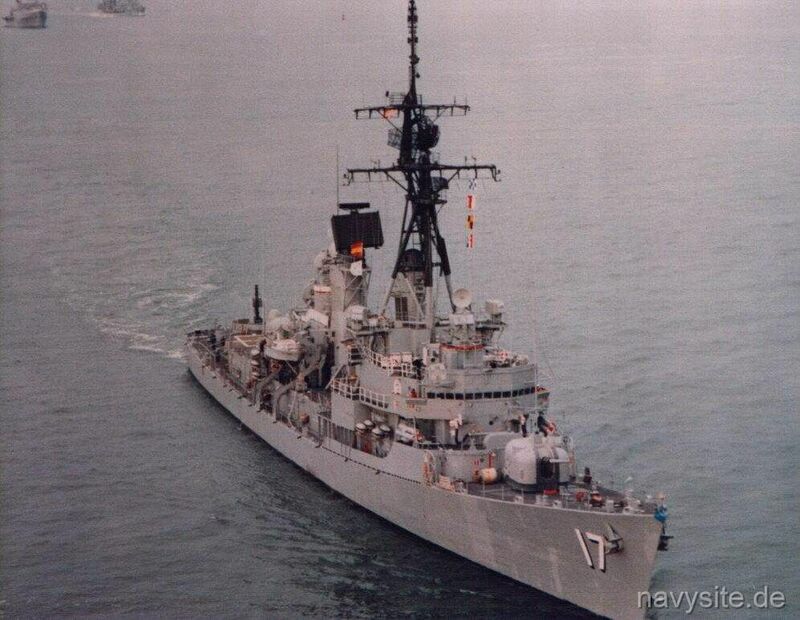 August 25, 1976 western Mediterranean USS CONYNGHAM and USS JOSEPHUS DANIELS (CG 27) are in a minor collision during "National Week 21" exercises in the western Mediterranean. 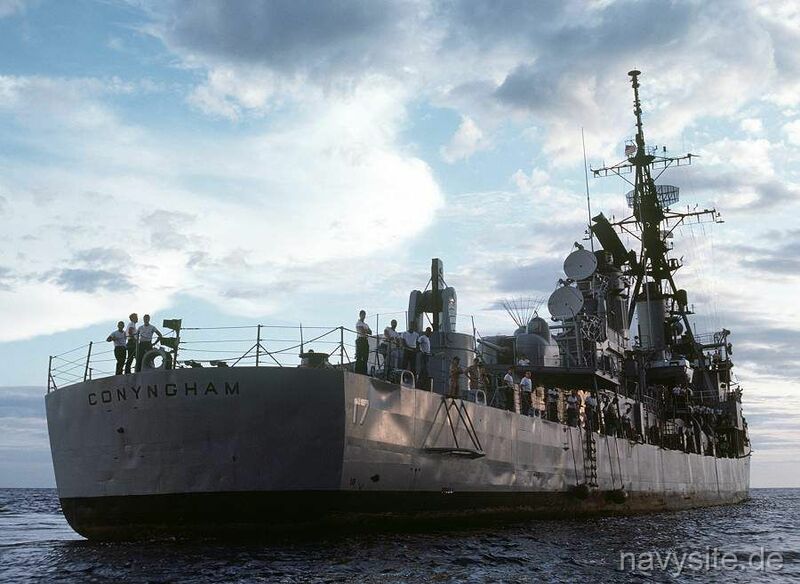 July 13, 1979 USS CONYNGHAM suffers two minor fires on consecutive days in the First Division Berthing Compartment and the Anchor Windlass Room. An investigation leads to the arrest of an arsonist on July 14, the day of the second fire. 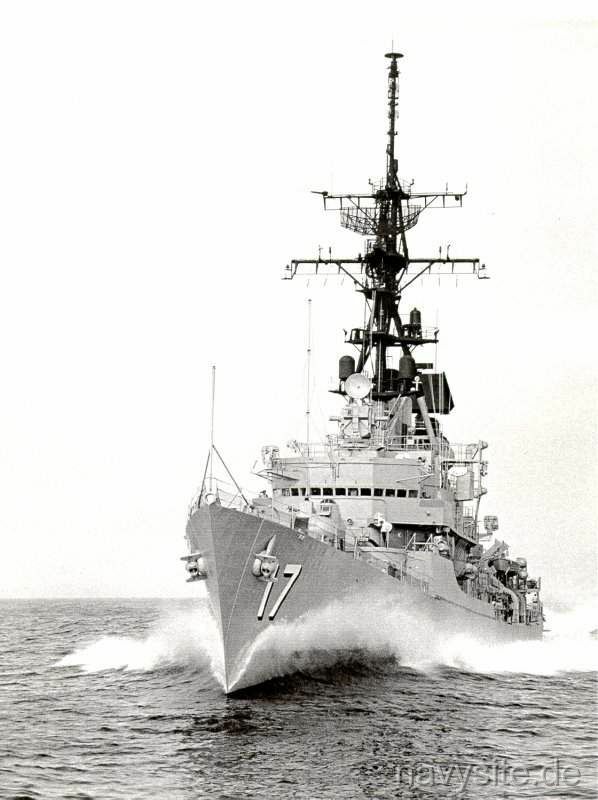 September 20, 1981 off the Mauritian coast USS CONYNGHAM runs aground momentarily while making a slow approach to the Mauritian coast causing minor damage to the sonar. 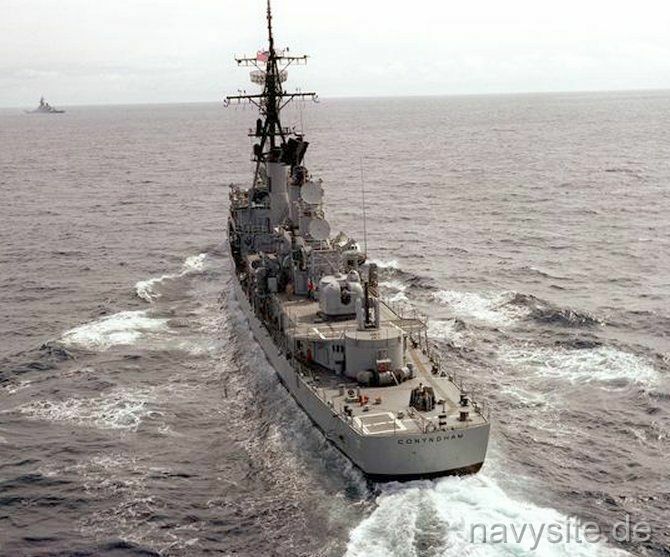 May 8, 1990 90 miles off Cape Hateras, NC USS CONYNGHAM suffers a major fuel oil leak and fire in the forward boiler room (Bravo 1). The fire started around 0445 a.m. and burned for 23 hours. The ship's Operations Officer LCDR A. Pope Gordon, Jr., was killed, and 18 other sailors were injured, some severely, putting out the uncontrollable fire. Later, more than 50 medals were given out for valor to CONYNGHAM sailors. USS CONYNGHAM was heavily damaged by the fire and the Navy decided that it was not cost-effective to completely repair the ship. That's why the CONYNGHAM was decommissioned 6 months after the accident. Born about 1744 in County Donegal, Ireland, Gustavus Conyngham commanded the merchant brig CHARMING PEGGY in 1775. When his ship was interned in Europe, Conyngham sought and on 1 March 1777 obtained a captain's commission in the Continental Navy. As commanding officer, successively, of SURPRISE, and REVENGE, he became a terror to British shipping, taking some 60 prizes in 18 months. As a privateer he was captured in 1779, escaped to Europe, and was recaptured while returning to America in 1780. Exchanged a year later, he was in France preparing to cruise against the British when the war ended. He returned to the merchant service and commanded the armed brig MARIA during the Quasi-War with France. As a member of the Common Council of Philadelphia, he assisted in the defense of that city during the War of 1812. Captain Conyngham died 27 November 1819 at Philadelphia, Pa.